The gas industry has slammed the government’s Renewable Energy Target (RET) legislation saying it is flawed and was misleading consumers. Under the RET legislation to be introduced in parliament this week, households which install an electric water heater can apply for a rebate. The Gas Industry Alliance says under the proposed RET, electric heat pump water heaters qualify as solar products and will be eligible for rebates. Group spokesman Peter Harcus said the legislation makes no sense and should be amended if the RET is to be effective. “Would you call your fridge a solar product? These electrical hot water products run the same way, driven by grid electricity and generate more greenhouse gas than genuine solar products,” Mr Harcus said. Mr Harcus said consumers were being misled by “bogus” solar products which run on electricity and produce more carbon emissions than a solar energy system. The gas industry group is calling for electric heat pump systems to be removed from the scheme. It says due to the inclusion of electric hot water systems for rebates, the RET will fail to deliver the 20 per cent electricity generation from renewable sources by 2020. Hmmm, a solar fridge…that’s one thing I haven’t seen Malcolm Douglas pull out of the back of his four-wheel drive yet. Maybe he will do so the next time Channel Seven decide to show one of his dubious outback cooking shows. 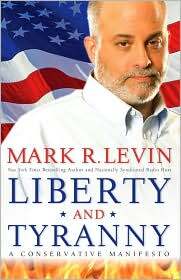 Another Sean Hannity interview for your enjoyment, this time with the author of Liberty and Tyranny: A Conservative Manifesto, US talk radio host Mark Levin. I finally got my hands on the book a couple weeks ago when I last returned from Deniliquin and am most of the way through it (it’s not particularly dense…it’s just that I haven’t had a lot of time to read of late) and intend on finishing it this week. The book spent seven consecutive weeks at the top of the New York Times bestseller list, and, at the time of the interview last week, had spent nine of the last ten weeks at the top of said list. Sean and Mark discuss the book, the mainstream media’s apparent lack of interest in the book, and how it relates to the Obama administration (despite it being written almost entirely before Obama was elected). I probably should have done this research before I drove to Deniliquin yesterday, but I ended up doing it afterwards and was slightly surprised by what I found. I do not, at this time, have a working car stereo, so have been relying on my iPod for audible entertainment during long and longish trips, and have been slightly concerned that such action may provoke a negative reaction from the police and incur a fine, however as I do not believe that it hinders my ability to drive, and instead makes it possible to concentrate for longer periods of time (I would have been very bored without it), it was worth running the risk. Last night, as the topic was starting to annoy me, I decided to do some research and found that it is perfectly legal in Australia to use an iPod (or other device) with earphones while driving, despite the fact that it can potentially block out external noises. When I thought about this, it made perfect sense as deaf people are able to drive (although I don’t understand how anyone can teach a deaf person to drive) and they can’t hear a thing, either inside or outside their vehicle, and to the same extent, it is legal to block out external noises with a car stereo (within prescribed environmental noise limits). Apparently the same can’t be said about using an iPod in this manner in the US, where most states have outlawed it for reasons which don’t make much sense to me. A word of warning though, much like the use of any device, if an iPod is distracting you from your driving, and you cause an accident, you can be charged with negligent driving. This is general information only and does not consider your needs and circumstances, nor is it a substitute for professional legal advice. You should seek professional legal advice before acting on any advice given herein.